Part 1 of this series highlighted the issues, regulatory and supply chain complexities and efforts by industry to tighten the control of precious minerals sourcing. 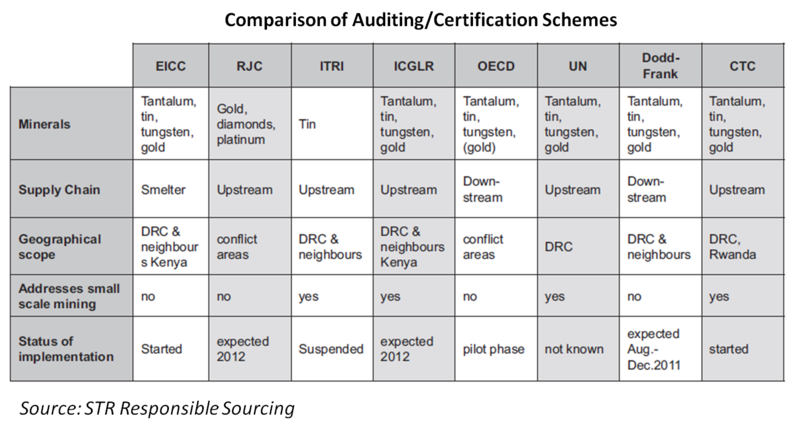 Part 2 of the series dove a bit deeper into efforts by key manufacturers in how they are auditing, validating and tracing the conflict minerals supply chain. The post also presented some ideas on and what responsibilities non-governmental organizations have had in shaping the debate over conflict minerals, and the roles or responsibilities that we as consumers should take in this thorny human rights- environmental impacts meets consumer products issue. The final part of this series highlights specific international guidance and steps that industries and consumers can and are taking to proactively address supply chain minerals sourcing and maintain a high level of corporate social responsibility. But before I go further, a postscript to Part 2. Following my second post, I was contacted by Suzanne Fallender of Intel with an update on the company’s efforts that I described in the second post. In her response, for which he apologized for the delay, she provided a copy of a white paper prepared and posted in late April. In it, the company states “we continue to work diligently to put the systems and processes in place that will enable us, with a high degree of confidence, to declare that our products are conflict-free. Our efforts on conflict minerals are focused in three main areas: (1) driving accountability and ownership within our own supply chain through smelter reviews and validation audits; (2) partnering with key industry associations, including the Electronic Industry Citizenship Coalition (EICC) and the Global e-Sustainability Initiative (GeSI); and (3) working with both governmental agencies and NGOs to achieve in-region sourcing”. The Intel white paper concludes by stating “From the time we became aware of the potential for conflict-metals from the DRC to enter our supply chain, we have responded to this issue with a sense of urgency and resolve. We have approached this issue like we would address other significant business challenges at Intel.” I believe Intel and their efforts to date bear that out. They are encouraging comments on their plans and efforts, which can be submitted at http://www.intel.com/about/corporateresponsibility/contactus/index.htm. By the way, I am still waiting on Apples reply to my inquiries. As mentioned in the second post, the OECD guidance, Due Diligence Guidance for Responsible Supply Chains of Minerals from Conflict-Affected and High-Risk Areas, serves as a common reference for all suppliers and other stakeholders in the mineral supply chain. The guidance also meshes well with current industry-driven schemes like the EICC and GeSi and AIGG guidance, and clarifies expectations regarding responsible supply chain management of minerals from conflict-affected and high-risk areas. A “conductor” is needed to convene a high-level diplomatic partnership on certification and help transform words into action. A “conductor”—a leader with gravitas and political support—is needed to bring stakeholders to the table and to issue a call to action. President Bill Clinton provided a precedent for this when he called together companies and sweatshop labor campaigners in 1996, resulting in the Fair Labor Association certification process. Certification should be governed and funded by a multi-stakeholder body that includes companies, governments, and NGOs. The legitimacy of a process rests on a multi-stakeholder governing and funding framework that ensures accountability. Certification must include independent third-party auditing and monitoring. Regular independent audits assure the public that the process is credible, and on-the-ground monitoring ensures accuracy. Transparency of audits and data is essential to making certification work. Certification processes are moving rapidly towards full disclosure of data and audits. The Enough Project report calls on the United States, through Secretary of State Hilary Clinton, to convene a senior partnership on certification with industry and the International Conference on the Great Lakes Region (ICGLR). The report also states that “the United States must act quickly, as minerals traders in Congo are already seeking alternative, opaque markets for their minerals. An internationally accepted certification process would deter this development.” Last week, a letter writing campaign launched encouraging U.S. Secretary of State Clinton to state a public U.S. position on this issue and convene a high-level partnership on certification with leading electronics and end-user companies, together with Congolese President Kabila and regional governments. The goal of this summit would be “aimed at unifying the regional and industry-led initiatives and gaining consensus on a system of independent checks on the ground”. Material Analysis Review: 1) Conduct a complete material analysis to demonstrate that all sources of materials procured by the smelting company are conflict-free; 2) Evaluate whether source locations are consistent with known mining locations; and 3) Establish whether material identified as “recycled” meets the definition of recycled materials. 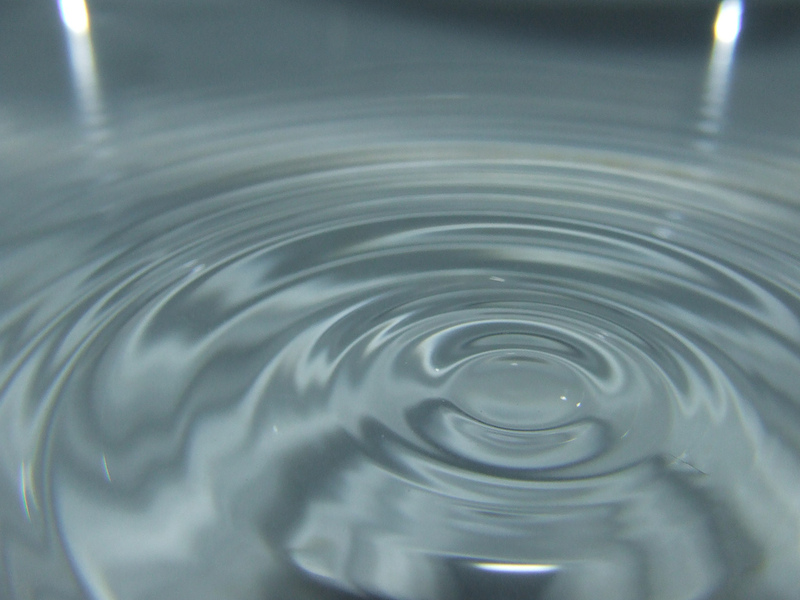 The CFS program is moving forward in spite of the delay by the SEC for final rulemaking. CFS assessments for tantalum began in the fourth quarter, 2010 and are expected to be posted on the EICC website starting this month. Tin, tungsten and gold are planned to commence later this year. What Makes a Good Auditor? … There are a number of auditor certifications that could be considered applicable to this scope of audit, but none should be considered to automatically qualify an auditor for these engagements. These audits require a unique blend of expertise in general auditing processes/procedures, environmental knowledge, accounting basics, chemistry/industrial processes, procurement controls, contracts and supply chain fundamentals. Finally, the auditor must be able to execute the engagement in accordance with the auditor/engagement standards of the Government Auditing Standards, such as the standards for Attestation Engagements or the standards for Performance Audits (GAO–07–731G) GAO-07-731G contains standards on auditor independence. Associations consist of multiple members who have varying degrees of business relationships with each other and the audited entities, putting the auditor in a position of serving “multiple masters” relative to influence over the audit scope, process, information, report and payment. Our research and inquiries to qualified experts in SEC auditing requirements indicates that there appears to be no precedent in any other legally-required audit in the US that has been fulfilled in this manner. I had the chance last week to listen in on an informative webinar by STR Responsible Sourcing. The company is an accredited monitor for numerous social certification programs, and partners with many organizations that share our mission of assuring responsible sourcing practices. The company compared governmental, regional, industry schemes for addressing minerals mined in conflict regions. The figure below summarizes each of the initiatives and target areas. If I were to look at where industry was a few short years ago on this issue compared to now, there’s no doubt that increased minerals sourcing tracing and accountability in conflict-free minerals is improved. The system as presently planned, in pilot stages or in process certainly has some flaws as most new initiatives have. But given the industry, region, national and international levels of cooperation that is rapidly becoming evident, I’ve no doubt that the positive outcomes will be great. Part 1 of this series highlighted the issues, regulatory and supply chain complexities and efforts by industry to tighten the control of precious minerals sourcing. This is especially critical in developing nations, where human trafficking, regional conflict and lack of environmental laws and basic human rights are the rule rather than the exception. This post will look into a few examples of key manufacturers and efforts to date audit, validate and trace the precious minerals supply chain and what roles non-governmental organizations and we consumers have played so far in addressing this prickly issue. The Organisation for Economic Co-operation and Development (OECD) issued a comprehensive guidance document in 2010 entitled Due Diligence Guidance for Responsible Supply Chains of Minerals From Conflict-Affected and High-Risk Areas. In this document, the OECD defined conflict-affected and high-risk areas as identified by the presence of armed conflict, widespread violence or other risks of harm to people. Recent efforts by global industry associations and grassroots efforts by non-governmental organizations such as the Enough Project and its Raise Hope for Congo initiative have shed a good deal of light on a previously ignored issue. Unlike other countries, ore extraction in the Congo is both cheap and lucrative for the militias that control many of the artisanal mines. There has been widespread reporting about how child laborers are kidnapped from neighboring nations to work under forced conditions in the mines, (where miners often work for an average of $1 to $5 per day). An excellent article that describes the political and institutional issues that affect conflict affected areas, see the article Behind the Problem of Conflict Minerals in DR Congo: Governance by the International Crisis Group. This analysis places a lack of governance within the Congo squarely as a cause of the rampant growth of the conflict minerals trade and diversion of proceeds from sale to armed militias. Despite the “technical assistance” the author says the country receives from outside organizations, this “is not enough to compensate for the notorious lack of administrative capacity”. The intensity of recent news reports and discerning lack of detail in publicly reported data to date begs the question- have Intel and Apple really completely taken the “conflict” out their precious minerals sourcing, as recent headlines suggested? Or has their recent announcement been taken out of context and only another (positive) phase in their supply chain sourcing strategy. And if neither actually procures these materials from the Congo, are they merely shifting the issues to Asia? Engaged with leading NGOs and other stakeholders to seek their input and recommendations. Hosted an industry working session at its offices in Chandler, Arizona in September 2009 with more than 30 representatives from mining companies, traders, smelters, purchasers, and users of tantalum to address the issue of conflict minerals from the DRC. Funded a study with EICC members on defining metals used in the supply chain, and continues working on a similar project to increase supply chain transparency for cobalt, tantalum, and tin. Important to note is that Intel was the first company in the electronics supply chain to conduct on-site smelter reviews. Since the end of 2010, Intel has visited more than 30 smelters to assess if any of its suppliers were sourcing metal from conflict zones in the. According to Ted Jeffries, Director of Fab Services and Consumables at Intel (who I also attempted to reach for this article), he recently stated “I don’t know that we have a complete handle on the whole supply chain, but we at least have a better handle on the nuances”. Despite a letter campaign to its suppliers, Intel elected to visit each site and see for themselves to verify what was being self reported. “For the most part, for the Intel supply chain, the smelters that we’ve visited have been very truthful. There have been little caveats here and there, but for the most part, we can trace all of their sources to plants in Australia, South America and other parts of the world,” Jeffries said at the Strategic Metals for National Security and Clean Energy Conference in Washington D.C. in mid March. As I’ve reported in Part 1 of this series, the multitude of supply chain layers and sourcing channels developed over the years may be a difficult weave to untangle (often 5-10 layers between the mine and the end product). Take Apple, who (according to its recently released 2011 Supplier Responsibility Progress report ) has 142 suppliers using tin; these suppliers source from 109 smelters around the world. As a key participant in the EICC/GeSi CFS initiative, smelter audits are in process. Additional efforts to contact Apple supply chain and sustainable sourcing staff have been unanswered. Unlike Apples sub-par sustainability efforts with its Chinese electronics supply chain, it’s heartening that the company is taking some leading action in this area. Hewlett-Packard says, “[T]hese issues are far removed from HP, typically five or more tiers from our direct suppliers.” But they have gone a long way in developing an aggressive auditing, tracking and reporting mechanism. 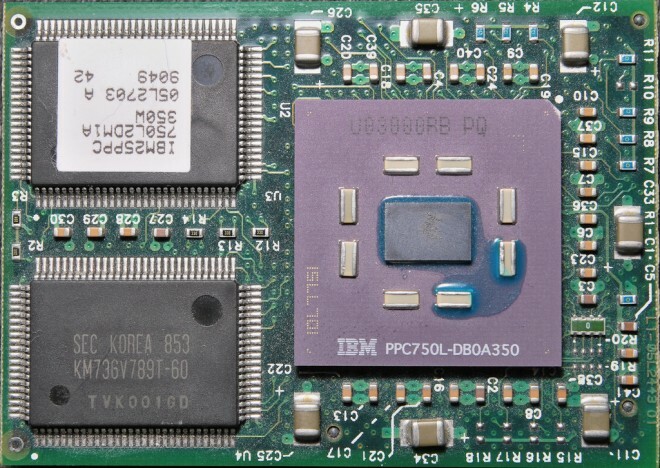 HP and Intel have published the names of their leading suppliers for the 3T metals, as well as some smelters. On April 8th, HP issued its revised Supply Chain Social and Environmental Responsibility Policy as part of list supplier compliance program (which HP began developing ten years ago). HP’s suppliers are expected to “ensure that parts and products supplied to HP are DRC conflict-free”. Moreover suppliers are to establish policies, due diligence frameworks, and management systems, consistent with the OECD Due Diligence Guidance for Responsible Supply Chains of Minerals from Conflict-Affected and High-Risk Areas. “I’m a Mac and I’ve got a Dirty Little Secret”. That was the title of parody of the Apple ad campaign, issued last year by the Enough Project. While the video took a soft-handed approach to helping consumers make a visceral connection with conflict minerals, it also suggested that consumers’ purchasing power can influence corporate sourcing behaviors…and they can. As an effort to raise consumer awareness of efforts that companies are (or are not) taking, the Enough Project surveyed the 21 largest electronics companies to characterize progress made toward establishing documented and verifiable conflict-free supply chains in Congo. 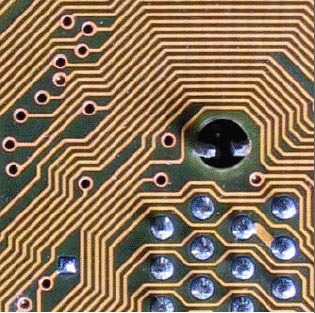 The project ranked electronics companies in and four other product sectors on actions in five categories that have significant impact on the conflict minerals trade: tracing, auditing, certification, legislative support, and stakeholder engagement. Four levels of progress (ranging from Gold Star to Red) were established based on efforts to date and suggestions to shore up perceived weaknesses. The user-friendly ranking can be used by consumers to support purchasing decisions and offers a way to get in contact with each company to communicate calls to action. 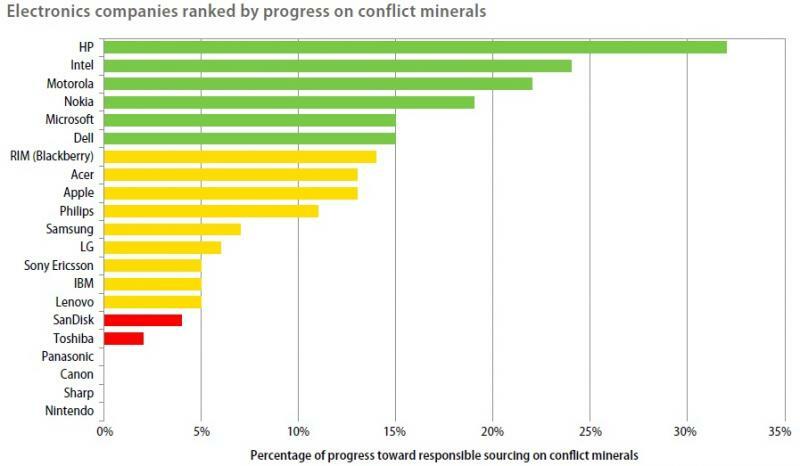 Enough Projects analysis (as shown in the graphic) indicates that six electronics companies are leading industry efforts to address conflict minerals, while two-thirds of the appeared to be taking limited action. This graph also suggests that the bottom -third are way behind the industry curve. Meanwhile, the auto, jewelry, industrial machinery, medical devices, and aerospace industries are well behind the electronics sector and only now beginning to address the role that conflict minerals may play their respective supply chains. 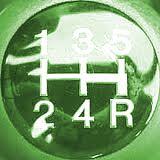 I’ll be watching with interest what the Automotive Industry Action Group does. So the opportunity for direct end-consumer advocacy to influence corporate social responsibility in sourcing is bountiful. Evidently, the biggest challenges to grabbing the conflict minerals issue by the reins is in untangling the convoluted supplier network, building a robust product traceability and independent verification process, and enacting sound policy that drives accountability and transparency among all stakeholders. Not an easy task, but compared to years past, a vast improvement for sure. The final part of this series will highlight specific international guidance and steps that industries and consumers can continue taking (while we wait for the SEC rules to get finalized) to proactively address supply chain minerals sourcing and maintain a high level of corporate social responsibility. The Enough Projects focus is on conducting field research, consumer and issues advocacy, and communications to support a grassroots consumer movement. Last week, it was widely reported that both Intel Corporations and Apple Computers had pulled the plug on sourcing of precious minerals typically used in the manufacturing of its high-tech products from the Democratic Republic of the Congo (DRC). These basic building blocks of our cell phones, computers and other consumer electronics are widely known as “conflict minerals”, mainly because of the large spread connection the “artisanal” and industrial mines that produce the materials and the flow of money to supply arms to rebels fighting in the DRC. Conflict minerals are to the 21st Century high-tech world what “blood” diamonds were to the 19th and 20th centuries. Apple, Intel and other U.S. based corporations have signed onto the Conflict-Free Smelter (CFS) program, which applies to shipments of tin ore, tungsten, gold and coltan from Congo and its neighbors. The CFS program demands mineral processors prove purchases don’t contribute to conflict in eastern Congo. The regulations were developed by the Washington-based Electronic Industry Citizenship Coalition (EICC) and Global E-Sustainability Initiative (GeSI) in Brussels (Belgium), representing electronics companies including Intel and Apple, Dell etc. The program is being marshaled by the GeSI Extractives Work Group, and summarized on the EICC website. The CFS initiative was established in response to the conflict minerals provisions of the Dodd-Frank Wall Street Reform and Consumer Protection Act of 2010), signed into law last July (page 838 of the 848 page Act to be exact). 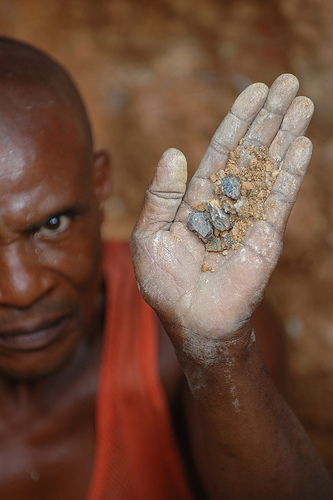 Section 1502 requires companies to make an annual disclosure to the Securities and Exchange Commission regarding whether potential conflict minerals used in their products or in their manufactur­ing processes originated in the DRC or an adjoining country. If the minerals were sourced from these countries, companies must report on the due diligence measures used to track the sources of the minerals if they were derived from the DRC or neighboring nations. In addition, the Act will require a 3rd party audit to verify the accuracy of the company’s disclosure. Finally, a declaration of “DRC conflict-free” must be provided to support that goods containing minerals were not obtained in a manner that could “directly or indirectly … finance armed groups in the DRC or an adjoining country”. The U.S. Securities and Exchange Commission was to have issued regulations to stem purchases of conflict minerals this week. However, on Monday the SEC delayed issuance of the specific rules to the August-December timeframe. Ultimately, U.S. companies will be required to audit mineral supplies next year to identify purchases that may be tainted by the Congo fighting, according to draft SEC regulations. Two groups of companies will be directly impacted by the Conflict Minerals Law: companies that are directly regulated by the SEC, and companies that are not SEC-regulated, but are suppliers to impacted companies. Starting April 1, the CFS scheme began requiring due diligence and full traceability on all material from the Congo and other neighboring conflict zones. Then, these audits, or at least their summaries, are to be incorporated into SEC regulatory findings (in some manner, as yet to be defined by the SEC). 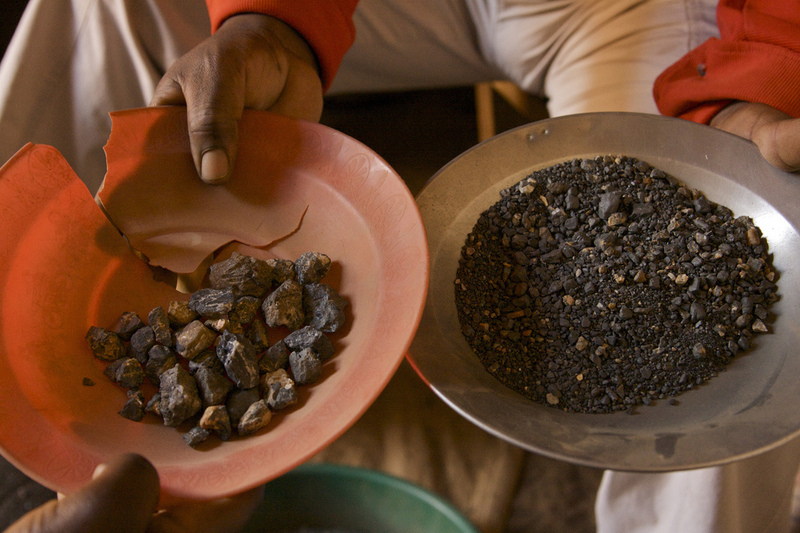 Meanwhile, this past Tuesday, committee of the California State Senate passed a Senate Bill 861 Tuesday that will curb the use of conflict minerals from Congo. The 9-1 vote in the Governmental Organization Committee was a first step to making California the first “conflict-free state”. If it passes the full assembly, the bill would prohibit the state government from contracting with companies that fail to comply with federal regulations on conflict minerals. According to D.C. attorney Sarah Altshuller (@saltshuller) “The California legislation, even if passed, is unlikely to impact many companies: it would apply only to companies against which the SEC has filed a civil or administrative enforcement action. That said, California’s legislative activity reflects significant stakeholder concern, as well as advocacy activity, regarding the ways in which the sourcing of specific minerals may be contributing to the ongoing conflict in the DRC.” Many engaged in the initial debate were concerned too that the state was too early to move forward in the absence of final SEC rules. Defacto or preemptive, this move is long overdue and is bound to bring to light an elephant in the room that manufacturers and consumers alike have been quick to run from and avoid. I’ve reported in recent posts my dismay over the approach that Apple has taken in addressing its supply chain sustainability issues, especially in Asia. The fact that Apple has electively chosen, along with Intel to be a first mover to shake the supply chain up and seek to right some corporate social responsibility wrongs is encouraging. However as my colleague Mr. Kaye correctly notes, neither may have had a choice. How Many Companies are affected? For the first category, the SEC estimated that 1,199 companies will require a full Conflict Minerals Report. The methodology for determining this number is worthy of mention. The SEC began by finding the amount of tantalum produced by the DRC in comparison to global production (15% – 20%). The Commission selected the higher figure of 20% and multiplied that by the total number of affected issuers, which they stated is 6,000. (75 Fed. Reg. 80966.) Clearly, this methodology does not consider many additional factors and the actual number of companies that will require the full audit is certain to be higher. For the second category – the suppliers – no estimate has been made. But if one anticipates 10 suppliers (we have data indicating that the number of suppliers ranges from one to well over 100 for a single directly-regulated company; an average of 10 suppliers may be conservative, especially given the wide range of conflict mineral-containing products) for each company directly regulated, the number of additional companies impacted would be 12,000. As I noted in a past post on “materiality”, surveys taken from manufacturers suggest a lack of confidence in being able to confidently trace conflict minerals to the source (excluding the likelihood that illegal extracted minerals are also blending into the marketplace). So you could see the difficulty in companies demonstrating due diligence in tracing the chain of materials flows from point of origin. According to Treehugger ace writer Jami Heimbuch , plugging the supply chain to assure the at all minerals come from conflict free zones is no easy task. Ms. Heimbuch reported that even Apple has noted how it is nearly impossible to know the exact source. The proposed SEC rules do attempt to take on suppliers who have “influence” over contract manufacturers who provide name brand products for larger companies. The proposed rules also apply to retailers of private-brand products and generic brands. Finally there is some ambiguity around how scrap electronic waste is to be treated. The SEC has not defined what is recycled or scrap material and manufacturers have a fair degree of latitude in their disclosure reports as to how they will treat scrap/recycled material. If it is impossible to track the source of all the minerals going into the stream, then the big question is what countries and companies will do to fix inadequate governance and systems. And if U.S. companies shift their sourcing to other nations, will this be enough? Is global manufacturing merely playing “kick the can”? The conflict minerals issue just may be the “perfect storm” that combines elements of resource consumption, consumerism, corporate social responsibility, supply chain management, politics and product stewardship. The next post in the series will dive a bit deeper into efforts by key manufacturers in how they are auditing, validating and tracing the conflict minerals supply chain and what responsibilities we as consumers have in lessening the impacts of this perfect storm. As part of the Conflict-Free Smelter program, participating tech companies must provide third-party verification that their processors don’t contain commonly used minerals that fund armed conflicts in Central Africa, specifically the Democratic Republic of Congo. Minerals from Central Africa commonly sourced for tech components include gold, titanium, tungsten and tin; the DRC provides 5 percent of the world’s tin supply, as well as 14 percent of tantalum. In Part 1 on this series, I presented some definitions of reverse logistics from a traditional versus sustainability focused mindset, and extended product responsibility. Reverse logistics includes processing returned merchandise due to damage, seasonal inventory, restock, salvage, recalls, and excess inventory. It also includes recycling programs, hazardous material programs, obsolete equipment disposition, and asset recovery. While product “take-back programs” have been a part of many companies operational playbook for some time, more sophisticated approaches are emerging which involve greater degrees of coordination and planning among multiple suppliers. Refurbishing – similar to reconditioning, except with perhaps more work involved in repairing the product. Recycle – when a product is reduced to its basic elements, which are reused – also referred to as asset recovery. In a post this week by author Marc Gunther, Walmart announced that as part of its efforts to reduce its waste streams from its retail and distribution centers, they are working with one if its suppliers (Worldwise) to begin what it calls the Full Circle program. This program creates a closed-loop system that takes old plastic bottles, clothes hangers, plastic bags and corrugated cardboard and makes new products from materials that would otherwise be waste- and turns them into eco friendly pet products that are in turn resold in Walmart stores. And there you have it-trash to treasure through “upcycling”. What alternatives are available to recover products, product parts, and materials? Who should perform the various recovery activities? How should the various activities be performed? Is it possible to integrate the activities that are typical for reverse logistics with classical production and distribution systems? What are the costs and benefits of reverse logistics, both from an economical as an environmental point of view? As an example, the graphic below presents a conceptual supply chain “total carbon footprint” and the various touchpoints from a manufacturing and reverse logistics perspective (graphic via Reverse Logistics – Turning Green to Gold, Reverse Logistics Magazine, Aug/Sept 2008). Once you can get a handle around which products pose the greatest asset value in terms of recoverability, the next phase is in looking for potential ways to reprocess or reuse waste byproducts or other manufacturers that may be turn your waste into their product feedstock. Either way it’s a win-win-win- for your company, your customers and the environment. Further posts will focus on proactive steps that companies can take to design sustainability in product manufacturing, and ways to coordinate reverse logistics campaigns with suppliers and customers. Meantime, it would be valuable to this readership if you’d consider sharing what your company is doing to “lighten the environmental load” on the planet and in your manufacturing process. I Love Logistics. That is the new brand “That’s Logistics” ad from UPS– and I love it. Why? First, because it’s a catchy ad and it made me smile. But also, because in the jingle, there’s a line: “carbon footprint reduced, bottom line gets a boost, that’s logistics.” This phrase should be a subtle reminder logistics and supply chain professionals that there is a bottom line angle to towing the “green” line. Read on and you’ll see why. Reverse logistics isn’t anything new. The field of study and application of reverse logistics in the supply chain space has at least a 40-year evolutionary history. What is new, though, is the intersection of reverse logistics with social and environmental issues. This definition supports the realization of a true “closed loop supply chain.” Closed-loop supply chains emphasize the importance of coordinating the forward with the reverse streams. 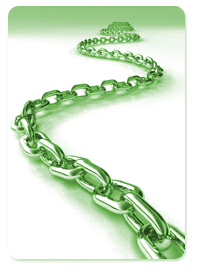 This underscores certain aspects of the cradle to cradle (C2C) concept advanced by McDonough and Braungart and the idea of “extended producer responsibility.” And that is precisely why supply chain and logistics professionals can take a move or two from the C2C playbook and apply their trade–in reverse.